A 5 year old female patient presented to me recently requiring GETA for dental rehab. The patient had a history of fatty acid oxidation deficiency, and the parents stated they believed it was a long chain fatty acid oxidation deficiency. The patient was taking carnitine, but otherwise was not symptomatic. She underwent a routine General anesthetic with inhalational induction using Sevoflorane and fentanyl for pain control. Since the procedure was brief, and she was the first case of the day, her blood sugar was not checked. Immediately after emergence from anesthesia, she was provided with a popcicle high in sucrose. Anesthesiologists are not infrequently confronted with patients who have congenital diseases related to inborn errors of metabolism. Fortunately, although there are numerous diseases that fall into this category, the management and presentations often overlap. Propofol infusion syndrome has features that includes severe bradycardia leading to asystole if at least one of the following is also present: metabolic acidosis, rhabdomyolysis, hyperlipidemia, and enlarged fatty liver. Although rare, the literature suggests a mortality rate of about 50%. There are several factors that seem to predispose patients to this illness: young age, severe critical illness of CNS or respiratory origin, exogenous catecholamine or glucocorticoid administration, inadequate carbohydrate intake and subclinical mitochondrial diease. The first case of PRIS-related death was in Denmark in 1990 . A two year old girl was sedated with propofol (10 mg/kg/hr) and developed metabolic acidosis, heart failure, hypotension, and hepatomegaly. While initial hypotheses regarding PRIS blamed the metabolic acidosis on impaired hepatic lactate metabolism caused by intralipid present in propofol leading to lactate accumulation and acidosis, more recent work suggests causes related to mitochondrial dysfunction. Recent studies have shown reduced cytochrome C oxidase activity and complex IV activity. Wolf et al. were the first to indict mitochondrial fatty-acid oxidation as a source of PRIS. They found that long-term propofol infusion was associated with an increase in malonylcarnitine, which inhibits carnitine palmityl transferease, a mitochondrial transport protein. 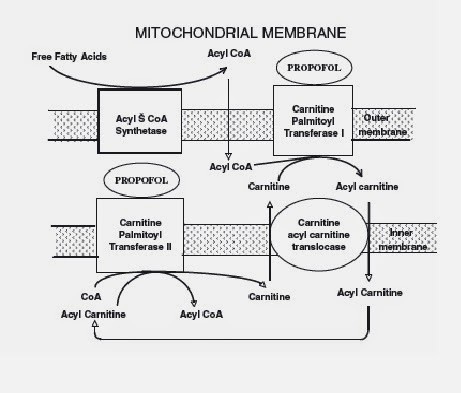 While long chain acylcarnitine esters are thus inhibited from entry into the mitochondria, short and medium chain fatty acids (which can diffuse without the aid of carnitine palmityl transferase) do so to a greater degree than normal. Short and medium chain fatty acids diffuse into the mitochondria and inhibit the respiratory chain at complex II. Thus, propofol can mimick the clinical features of both mitochondrial mypopathy and mitochondrial fatty acid metabolism. Steiner  and Farag  both recommend that propofol should not be used in patients with inborn errors of mitochondrial fatty-acid metabolism (very long chain acyl-coenzyme A dehydrogenase deficiency) because it interfered with fatty-acid oxidation and caused severe metabolic acidosis. Understanding the pathophysiology of PRIS, aids in the approach and understanding of less common genetic metabolic conditions related to the mitochonria and fatty acid oxidation. Therefore, as in PRIS, patients who have mitochondrial defects related to the electron transport chain, or defects with metabolism of fatty acids, are more likely to suffer ill effect when stressed. The stress response illicits the release of catecholamines and increases the baseline metabolic rate. 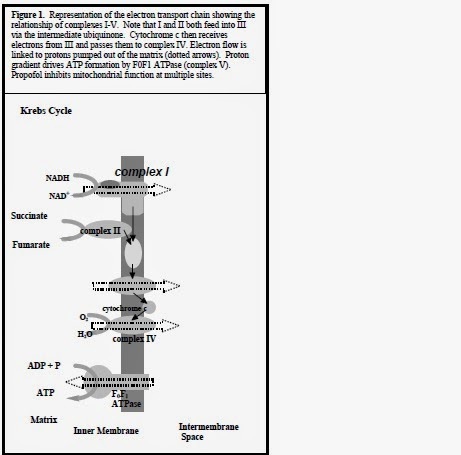 This initial response leads to rapid breakdown of glycogen, lipolysis and increased glucose metabolism via the Krebs cycle. Glycogen stores are reduced of course, in the pediatric population as well as those who are ill and malnourished due to chronic illness. As glucose is used and ongoing lipolysis leads to increased serum levels of free fatty acids, the muscles and myocardium turn to beta oxidation for the generation of substrates for fuel. In fact, cardiomyocytes use fatty acid oxidation as the preferred source of energy. Beta oxidation occurs in the mitochondria and requires the transport of Long chain fatty acids from the outside across two lipid membranes. Propofol, as indicated mimicks Very Long Chain Fatty Acid deficiency (VLCAD) by inhibiting Carnitine Palmitoyl Transferease. In all of the disorders related to fatty acid oxidation, inadequate levels of ketone bodies are produced in the face of rising levels of free fatty acids during episodes of stress (catecholamine surge leads to lipolysis) or starvation. Ketones are the bodies key energy source following the depletion of glycogen stores. Unfortuntely, when fatty acids are not utilized for ketone body formation in the face of starvation, free fatty acids are instead attached to glycerol to form triglycerides which are deposited in the liver during acute episodes. This can result in acute fatty liver and failure when severe. In addition, the failure of beta oxidation leads to impaired production of Acetyl CoA. Acetyl-CoA is a key substrate of the tricarboxylic acid (TCA) cycle. Therefore, gluconeogenesis is impaired (as many other TCA dependent systems for energy) due to impairment of the pyruvate carboxylase system which relies on acetyl-CoA. Because the heart and skeletal muscle are primarily dependent on Long Chain Fatty Acids, these disorders can present with acute or chronic cardiomyopathy, or acute exercise induced rhabdomyolysis. During decompensation, blood levels of free fatty acids along with acyl carnitines, creatine kinase, and liver enzymes, would increase while ketone bodies would be minimal. Anesthesiologists need to be aware of the potential for these metabolic disorders in apparently healthy children who have yet to receive a diagnosis. This occurred in a 3 year old female patient who died after dental surgery secondary to fasting resulting in severe hypoglycemia. Two years after her death, dried blood from her old quilt was used to extract DNA and make a diagnosis of Very Long Chain Acyl-Coenzyme A Dehydrogenase deficiency (VLCAD) . In a recent case report of an anesthetic in a patient with VLCAD, the authors avoided inhalational agents as these have been associated with elevations of free fatty acids . However, this is likely only important in patients with severe symptoms or requiring prolonged fasting without access to glucose. The authors, furthermore, avoided poropofol for obvious reasons, opting instead for thiopentone with regional nerve block. They also began a dextrose infusion at 8 mg/kg/min. For patients with significant disease, symptomatic or uncontrolled, all of these options may be important. The interventions with greatest impact are likely to be avoidance of prolonged fasting (no more than 3 hours), providing adequate access to glucose, and avoidance of the stress response. This includes the emotional distress that may attend an inhalational induction. Regional anesthesia when possible is also important. Patients undergoing anesthesia must be carefully evaluated for cardiomyopathy, respiratory depression from hypotonia, and neurologic disorders. Furthermore, in many of theses disorders, skeletal muscle disorders makes succinylcholine contraindicated and rhabdomyolysis is a concern. The most common form of theses diseases in Medium Chain Acyl CoA Dehydrogenase Deficiency (MCAD), is the most common disorder of beta-oxidation of fatty acids. A case report discusses the perioperative issues surrounding this disorder and how they relate to those discussed above . The case involved an adult female who underwent emergency laparoscopic ovarian cystectomy who had compound heterozygous MCAD. The authors report an complicated general anesthetic induction with thiopental and succinylcholine followed by an uncomplicated surgery. She was given an intravenous infusion of 5% dextrose preoperatively which was continued at 100 mL/hr during anesthesia. Sevoflurane was used for maintenance and one bolus of 10% dextrose (100 mL) was given for intraoperative hypoglycemia of 82 mg/dL. 5% dextrose was infused postoperatively until feeding was well established 2 hours post operatively. Patients with problems of fatty acid metabolism will always need careful monitoring of glucose levels, in particular in those children younger than age two. Short fasting intervals and consideration of supplementation with IV dextrose will maintain energy needs avoiding metabolic acidosis and energy depletion. Obviously, given the biochemistry of propofol, long infusions at high doses are contraindicated. In patients with only mild disease that is well managed, a small induction dose of propofol is not likely to cause problems. 1. Hatch DJ. Lancet 1999; 353:1117-8. 2. Wolf A et al. Lancet 2001; 357:606-7. 3. Steiner LA. paediatric anaestheia 2002;12: 187-91. 4. Farag E. Anesthesiology 2005; 102: 697-8. 5. Roe CR. J Pediatrics 2000; 136: 397-399. 6. Kleemann PP. Anaesthesist 1986;35: 604-8. 7. Mitra A, Husaini S, and John L. Internet J of Anesthesiology 2008; 21, 1.